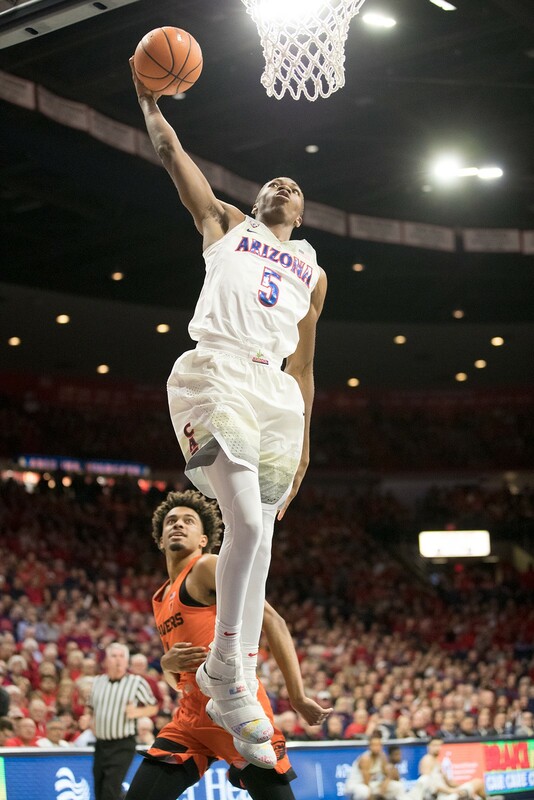 The University of Arizona Wildcats overcame a night of skittish play and erratic offense to rout visiting Houston Baptist in the home side's opener on Wednesday, 90-60. Ninth-year Wildcats Coach Sean Miller described the team's play against the Huskies as a tale of two halves. Fortunately for Miller and his players, the tale had a happy ending, thanks to shooting 57.6 percent from the field in the latter half of the contest, with the squad hitting seven of their final nine shots. "We didn't have a great deal of confidence, which, you know, that's kind of who we are right now," Miller said. "We're a group of guys kind of playing together for the first time and I think our hope is to continue to work, practice, go through experiences, we will improve." The Wildcats were led on Wednesday by sophomore guard Brandon Randolph, who scored a game-high 25 points on 8-of-12 shooting in 31 minutes of action. "Brandon Randolph has done really well and it's more about opportunity, confidence that he's done really well this whole week," Miller said. "Sometimes that jump from a freshman to a sophomore is significant, and Brandon has always been able to shoot the ball. I think he is learning the game and he is more of a complete player." Miller heaped praise on Duke University transfer Chase Jeter, who pulled down a double-double (11 points and 10 rebounds) in the victory. "Chase is really bright kid. Great student, maybe the best student we've had. Very cerebral, thinks things through, and intelligent," Miller said. "Not many big guys draw charges, he does that a lot." Miller has high hopes for freshman guard Brandon Williams, who scored 13 points in his collegiate debut. That confidence stems from Williams' ability to get to the free throw line in his first start, making 8-of-9 attempts to finish as the team's second-leading scorer, despite shooting 2-of-11 from the field. "He didn't have his typical night," Miller said of Williams. "I will say this though, he had five assists and zero turnovers playing in a game like that, against that type of pressure. That's a job well done." The Wildcats return to McKale Center to face California Polytechnic University at 3 p.m. on Sunday. The Mustangs have not played a regular season game this season, coming off a year in which they went 9-22, with a 4-12 record against fellow Big West opponents. Miller said he hasn't watched much of Cal Poly's tape from last season, but expects his team to be ready for the challenge come Sunday. "I think we've got a great group of kids," Miller said. "[They're] very coachable, they like each other, they want to do things the right way. And how all that comes together, we'll see."